Hip No. 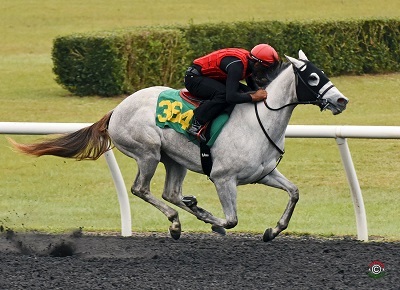 364, Libellule, consigned by de Meric Sales, Agent, breezed a quarter in :20 4/5 to post the fastest work at the distance at the second session of the Under Tack Show for the Ocala Breeders’ Sales Company’s 2017 March Sale of Two Year Olds in Training. The gray or roan filly by Kantharos is out of Barbarella, by Cutlass Fax, a daughter of stakes winner Beneficial Bartok. The session began more than an hour late due to heavy fog in the Ocala area. Once underway, the horses encountered a persistent headwind that increased throughout the day. Two youngsters worked quarters in :21 flat. Hip No. 305, a bay colt by Into Mischief consigned by Thoroughbred Champions Training Center LLC, is out of Wooden Nickel, by Divine Park, a half sister to grade one stakes winner Include Me Out. Hip No. 359, consigned by Eddie Woods, Agent, is a dark by or brown filly by Pioneerof the Nile, a half sister to stakes placed Lucky for You out of stakes winner Ayla Bella, by Touch Gold. A trio of youngsters shared honors for the session’s fastest eighth, stopping the timer in :9 4/5. Seven horses breezed eighths in :10 flat. Hip No. 229, a bay colt by Union Rags consigned by de Meric Sales, Agent, is a half brother to graded stakes winner Most Distinguished out of Stylish Storm, by Storm Bird. Hip No. 239, consigned by Hoppel’s Horse & Cattle Co., Inc., Agent, is a bay colt by Point of Entry out of Sweet Assay, by Consolidator, from the family of graded stakes winner A.P. Assay. Hip No. 241, consigned by Big Easy Farm, Agent, is a bay colt by Twirling Candy out of Sweetest Sound, by Smart Strike, a full sister to graded stakes placed Saint Vigeur. Hip No. 304, Finest Warrior, consigned by Crane Thoroughbred Services, Agent, is a dark bay or brown colt by Majestic Warrior, a half brother to stakes winner Gold and Roses out of Won Perfect Rose, by Air Forbes Won. Hip No. 323, consigned by Bobby Dodd, Agent, is a bay colt by Union Rags out of stakes winner Alexander Rylee, by Afleet Alex. Hip No. 350, a chestnut colt by Smart Strike consigned by Wavertree Stables, Inc. (Ciaran Dunne), Agent, is out of Ask Me When, by Speightstown, and is a three quarter to graded stakes winning stallion Dominus. Hip No. 399, a bay colt by Into Mischief consigned by Halcyon Hammock Farm, Agent, is out of Brianna Rose, by Distorted Humor, a half sister to stakes placed Anna Sophia. There were three quarters in :21 1/5. Hip No. 237, consigned by Q Bar J Thoroughbreds LLC, is a chestnut colt by Data Link out of Surf City Susie, by Old Trieste, a half sister to stakes placed Don’t Tell Ashlie. Hip No. 346, a bay colt by Morning Line consigned by Eddie Woods, Agent , is out of Arabian Song, by Forestry, a half sister to graded stakes placed Bodes Galaxy (IRE). Hip No. 367, a bay colt by Sidney’s Candy consigned by All Dreams Equine, is a half brother to graded stakes winner War Kill out of graded stakes placed Battenkill, by Rahy. A trio of horses worked quarters in :21 2/5. Hip No. 242, a chestnut colt by Data Link consigned by Doble Jak LLC, is out of Swingaway, by Tapit, a half sister to stakes placed Richiesgirlgotgame. Hip No. 349, consigned by Tom McCrocklin, Agent, is a chestnut filly by Tapit out of graded stakes placed Arienza, by Giant’s Causeway, a daughter of champion Azeri. Hip No. 362, a chestnut colt by Haynesfield consigned by Parrish Farms, Agent, is a half brother to stakes placed One Minute out of stakes placed Bach Hamilton, by Cherokee Run. The Under Tack Show’s third and final session begins at 8:00 a.m. on Saturday, March 11, with Hip No’s 451 – 677 scheduled to breeze.